The Large and Small Magellanic Clouds. The first written record of the Magellanic Clouds was by the Persian astronomer Al Sufi. In 964 he wrote the Book of Fixed Stars. He called the Large Magellanic Cloud al-Bakr (the Sheep) "of the southern Arabs". He wrote that the Cloud could not be seen from northern Arabia and Baghdad, but could be seen at the strait of Bab el Mandeb (12°15' N). This is the southernmost point of Arabia. The first Europeans to see the Clouds were Italian explorers Peter Martyr d'Anghiera and Andrea Corsali at the end of the 15th century. Antonio Pigafetta also saw them, when he went with Ferdinand Magellan on his circumnavigation of the world in 1519-1522. However, naming the clouds after Magellan did not become widespread until much later. In Bayer's 1661 book, Uranometria, they are called nubecula major and nubecula minor. In the 1756 star map by French astronomer Lacaille, they are called le Grand Nuage and le Petit Nuage ("the Large Cloud" and "the Small Cloud"). The Clouds can be easily seen without the use of a telescope. They look like separate pieces of the Milky Way. About 21° apart in the night sky, the real distance between them is about 75,000 light-years. They were long thought to be the closest galaxies to the Milky Way. The Canis Major Galaxy, discovered in 2003, is now thought to be our closest galaxy. The LMC is about 160,000 light years away, while the SMC is about 200,000. 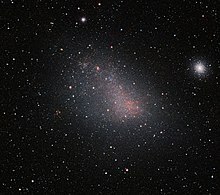 The LMC is about 14,000 light years in diameter, and the SMC about 7,000. For comparison, the Milky Way is about 100,000 light years across. Scientists believe that the shape of Magellanic Clouds has been caused by tidal interaction with the Milky Way as they travel close to it. Streams of neutral hydrogen connect them to the Milky Way and to each other. Both Clouds look like they were once spiral in shape. Their gravity has affected the Milky Way as well, distorting the outer parts of the galaxy's disc shape. They have a different structure and lower mass than our galaxy. There are two other big differences. First, they are gas-rich; they have more hydrogen and helium compared to the Milky Way. They are also more metal-poor than the Milky Way. The youngest stars in the LMC and SMC have less than half the amount of other elements. Both are noted for their nebulae and larger numbers of young stars. Like our own Galaxy their stars range from the very young to the very old, which shows the Clouds have a long history. A supernova, SN 1987A, in the Large Magellanic Cloud was the brightest object seen from Earth in over four centuries. In 2010, a French scientist  said that the clouds may have been ejected from a collision that formed the Andromeda Galaxy six billion years ago. However most astronomers believe the Magellanic Clouds were made in the same process that formed our Milky Way Galaxy. New research suggests that the SMC may in fact be split in two. A smaller part may hidden about 30,000 light years behind the SMC. This could have happened with the LMC splitting the SMC, and that the two sections are still moving apart. This smaller section is being called the Mini Magellanic Cloud. ↑ Shattow, Genevieve; Loeb, Abraham (1 January 2009). "Implications of recent measurements of the Milky Way rotation for the orbit of the Large Magellanic Cloud". Monthly Notices of the Royal Astronomical Society 392: L21–L25. doi:10.1111/j.1745-3933.2008.00573.x. http://adsabs.harvard.edu/abs/2009MNRAS.392L..21S. ↑ "Observatoire de Paris (Abd-al-Rahman Al Sufi)". Retrieved 22 July 2011. ↑ "Observatoire de Paris (LMC)". Retrieved 22 July 2011. ↑ "A cosmic zoo in the Large Magellanic Cloud". European Southern Observatory. 1 June 2010. Retrieved 29 August 2010. ↑ Macri, L. M.; et al. (2006). "A new Cepheid istance to the maser-host galaxy NGC 4258 and its implications for the Hubble constant". The Astrophysical Journal 652 (2): 1133–1149. doi:10.1086/508530. ↑ Freedman, Wendy L.; Madore, Barry F. 2010. The Hubble Constant Annual Review of Astronomy and Astrophysics. ↑ Hammer, F.; et al. (2010). "Does M31 Result from an ancient major merger?". The Astrophysical Journal 727 (1): 542–555. doi:10.1088/0004-637X/725/1/542. ↑ "Press release on Observatoire de Paris website, in French". ↑ "Andromeda: born out of a massive collision? | Bad Astronomy | Discover Magazine". blogs.discovermagazine.com. 2010. Retrieved 13 October 2011. ↑ http://adsabs.harvard.edu/full/1986ApJ...301..664M Astrophysical Journal, Part 1, vol. 301, Feb. 15, 1986, p. 664-674. Eric Chaisson and Steve McMillan, Astronomy Today (Englewood Cliffs: Prentice-Hall, Inc., 1993), p. 550. Michael Zeilik, Conceptual Astronomy (New York: John Wiley & Sons, Inc., 1993), pp. 357–8.